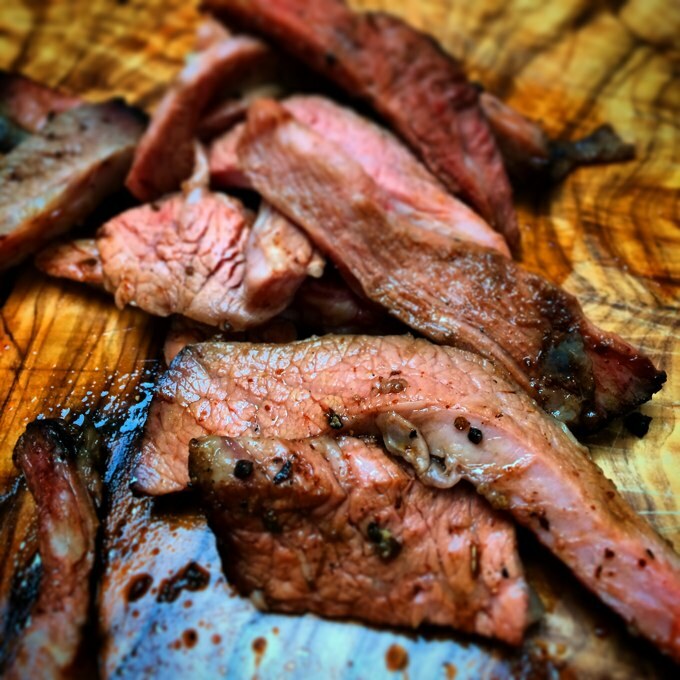 Inspired by a recent trip to the Adirondacks during which a good friend blew my mind with some awesome food and great company, I wanted to give hot smoking a beef brisket a go. Despite a few successes with cold smoking bacon and salmon, I'd never actually hot smoked anything. I'm sure people get a feel for it as time passes and they get to know their smoker better, but I wanted to take a more scientific approach. I bought a piece of brisket from local artisan butchers Flock & Herd and after a short consultation with Huey (owner of the awesome deli at the end of the road and generally opinionated foodie), covered it in molasses and a home-made rub (liberal amounts of garlic salt, celery salt, paprika, pepper and onion powder) and left it in the fridge for a couple of days. The Internet tells me that I should keep the meat at 225°F for 75 minutes per pound, which I unscientifically converted into new money as about 105°C for 35 minutes per kilogram. 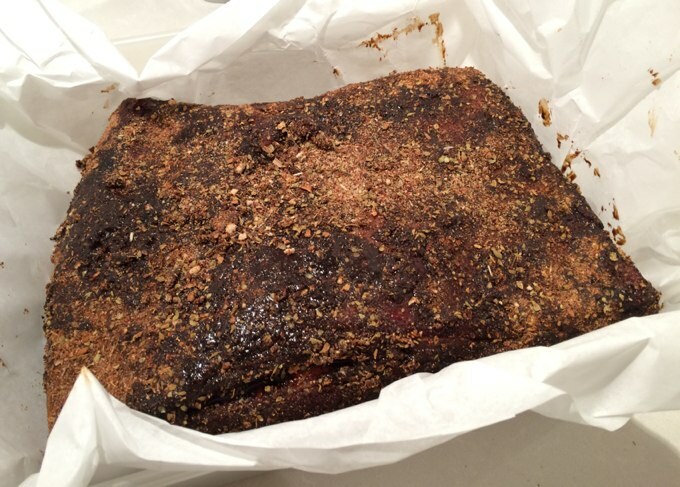 When the brisket reaches 75°C, wrap it in foil until it makes it to 85°C and you are more or less done. 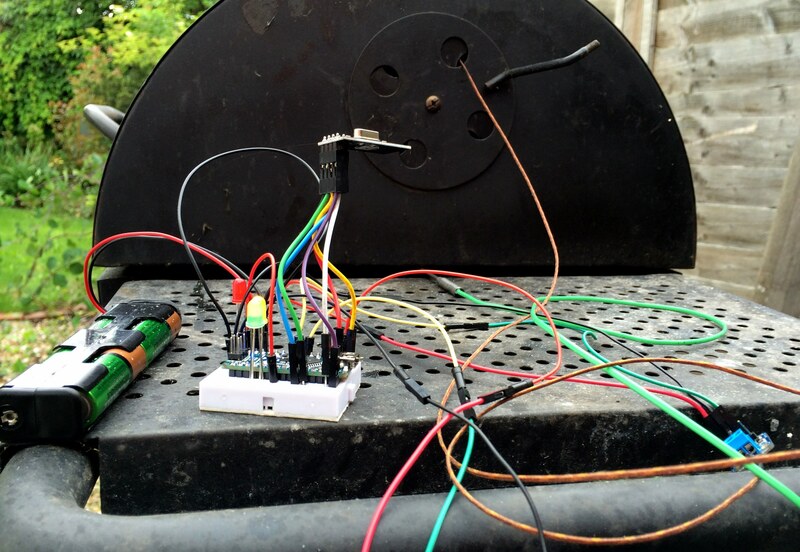 The ambient temperature inside the smoker could get into the hundreds of degrees quite easily so I needed something a little more robust than the TMP36 that came with my Arduino kit. Instead I looked into Type-K thermocouples as they are the sort of temperature sensor you'll find in your oven and they can easily cope with these sorts of temperatures. They need an amplifier to work which sounded complicated until I found the AD8495 breakout board (Adafruit to the rescue again) - you plug the thermocouple in one end, 5v and ground into the other and you get pin you can take a analogue reading from to get the temperature. Lovely. I bought two thermocouples - a glass braid one for measuring the ambient smoker temperature and a stainless steel one for measuring the internal temperature of the meat. Wait, I need to keep this thing tethered to USB? That was clearly not going to fly - I didn't really want to leave my laptop out next to the smoker all day so I needed a better solution. A while ago I picked up a bunch of nRF24L01+ based 2.4GHz wireless transceiver modules on eBay, little low-energy cards that talk an RF protocol similar to Bluetooth with data rates of up to 2Mbps. They interact with the Arduino via it's SPI pins. As luck would have it, someone's already provided some example code of how to get a nRF24L01 working with an Arduino, so the hard work had more or less been done for me. Under the hood, johnny-five speaks the Firmata protocol. Anyone who's attended a NodeBots meetup will remember firing up the Arudino IDE and loading the StandardFirmata sketch onto their board. StandardFirmata is only one of several options, another is ConfigurableFirmata. This is a version of Firmata that you can use to enable and disable functionality as required and seems to be where some of the more obscure bits of the protocol are implemented. If NETWORK_FIRMATA is defined, the stream that we created earlier gets passed to the Firmata class and it'll use that instead of the SerialPort class. This is great because all we need to do is implement the nRF24L01 driver as an Arduino stream, which is in the repo as WirelessClientStream.cpp. 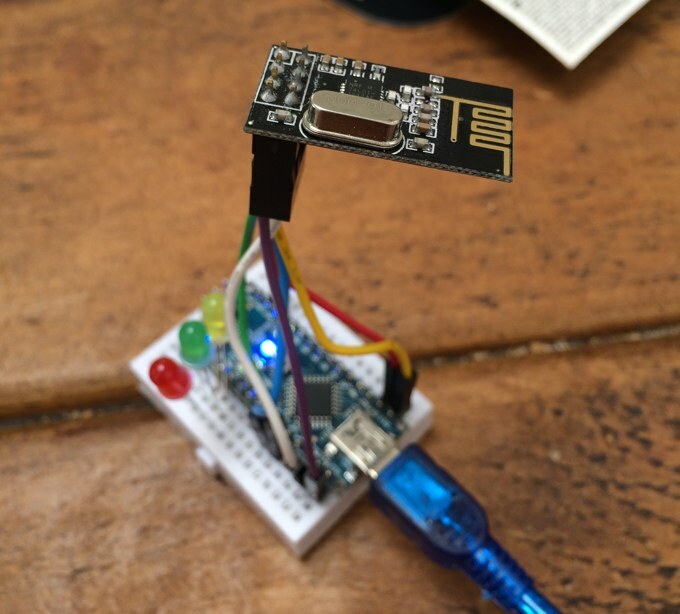 During the loop, if there's any data available from the wireless card, it writes it into the serial port for the computer to pick up, then if there's any data available from the serial port, it sends it over the wireless card to the remote Arduino. The idea is to be completely transparent. The temperatureSensor module is below. 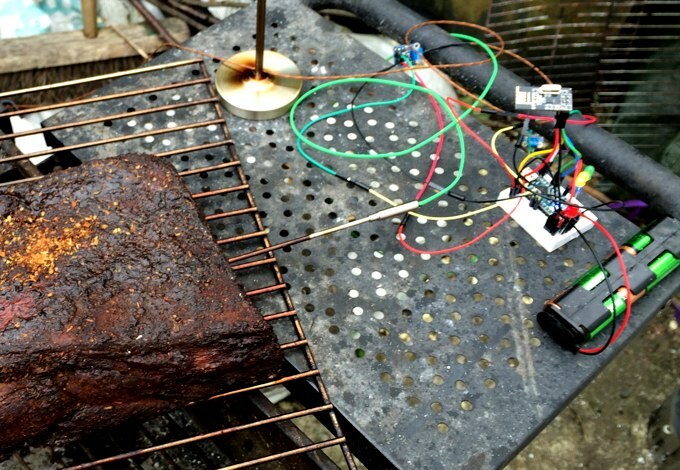 It reads the temperature from the thermocouple breakout board, converts it into centigrade and emits an event so listeners can do something useful with the recorded temperature. The astute reader will notice that I am explicitly turning on pin reporting in the temperatureSensor module. This is because for a reason I cannot comprehend firmata.js turns pin monitoring for all analogue pins by default. This is fine for high-speed, high bandwidth devices/connections (like the Uno over USB) but swamps the RF connection with unnecessary traffic. There's a pull request open around this, hopefully it'll get merged soon. In the interim you have to comment out this for loop in firmata.js to get it to work. Also, analogRead calls the passed callback loads of times instead of just once which was also a bit confusing. The really astute reader will notice a variable named fudgeFactor. That's a, uh, 'calibration'. It's hardware, right? The stainless steel sensor is inserted into the meat and the braid one is lying next to the contingency plan - an actual meat thermometer. What do you do with the data? Graph it, of course. 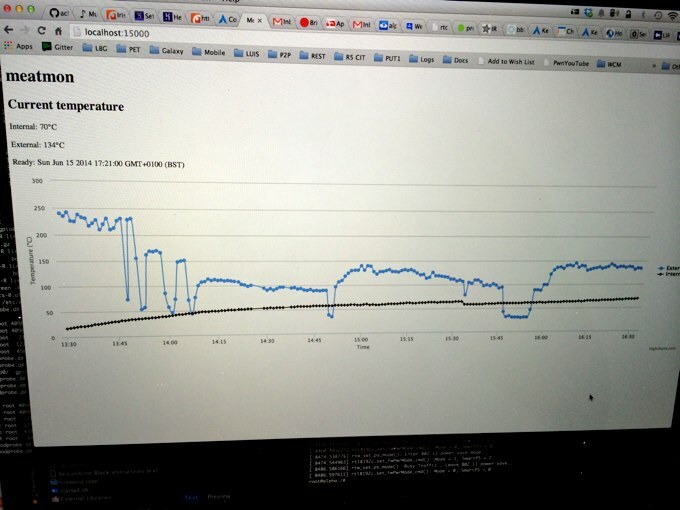 I ran a small webapp on my laptop that gave me a real-time(ish) readout of the internal and external temperatures, as well as a rough estimation of when the meat would be ready based on internal temperature and assuming a constant increase over time (I said it was rough). It stored the database in a local instance of CouchDB and had a Hapi driven REST API that the johnny-five process would post info to. It used wantsit for IOC, nano-repository to make database access a bit more bearable and columbo for REST resource discovery. What's nice is you can see the temperature being way too hot to start with, me freaking out and repeatedly opening the lid to remove coals, and when I opened the lid towards the end and forgot to put the external sensor back in. I managed to get a quick snap in before the wolves descended. You can see the johnny-five code and stat collector webapp in the achingbrain/meatmon repository. Using an XBee probably would have been a lot easier, but they are 5x the price of the nRF24L01+ and I don't own any.